The Site Museum is located at a distance of 3 kms., from Chandavaram Village and 13 kms., from Donakonda, the nearest Railway Station in Prakasam District. 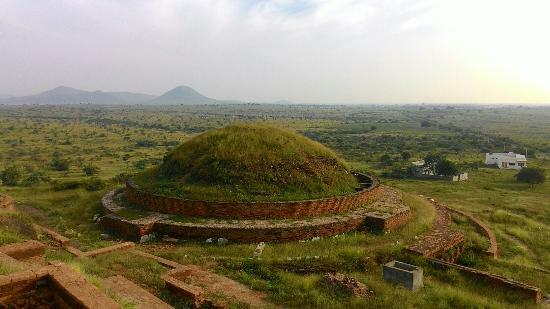 In 1965 a huge Buddhist Stupa was discovered at Singarakonda on the right bank of river Gundlakamma. The Department of Archaeology and Museums has conducted excavations at the site from 1972-77 and exposed Maha Stupa, Vihara Complex, Chaityagruha, Stair cases along with beautifully carved lime stone panels along with early historic pottery, coins, beads and brahmi inscriptions etc. With a view to showcasing all the objects retrieved from the excavations, the Department has constructed a building near the site and established the Site Museum in 1980. The drum and dome slabs, which are containing the Dharma Chakras, Stupa, and Bodhi Tree Panels, slaps with Jataka Stories are displayed in the Museum. But, unfortunately, three theft attempts have taken place and as per the orders Higher Authorities all the sculptures were shifted to the Panchayathi Building in Chandavaram Village. Recently, the Revenue Authorities have provided a land for the construction of the Museum Building in the village.